Burgundy Plush Christmas Stockings 21"
Burgundy Plush Monogrammed Christmas Stocking : : Large Burgundy Plush Stocking with Off White Plush Cuff. 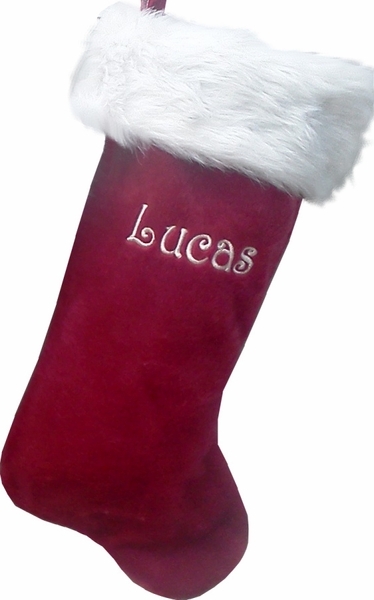 Names can be personalized on the body of plush Christmas stocking with SILVER or GOLD metallic embroidery thread. Materials: This stocking is made from acrylic plush. Size: 21 inches diagonally from the stocking loop to the toe of the stocking. The top opening is about 8 inches wide. Linig: This stocking is not lined inside.